Molex Incorporated augments its family of power products with the addition of the Nano-Fit and Ultra-Fit power connectors. 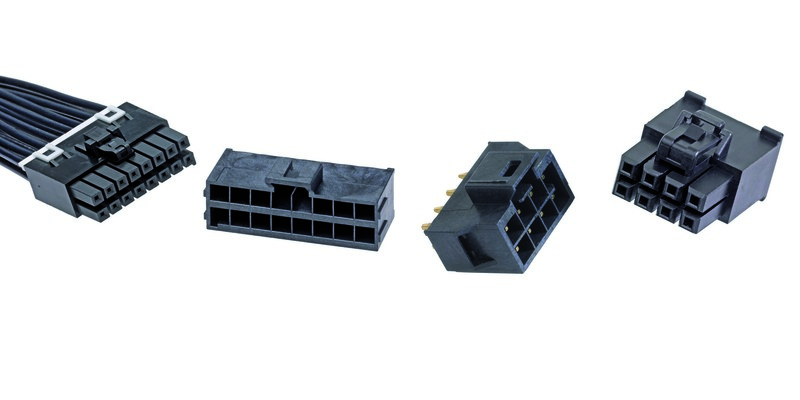 These feature-rich wire-to-board connectors combine small size and optimum current density making them an ideal choice for a wide range of applications across multiple industries, including consumer/home appliance; networking and telecommunications; industrial and automotive/commercial vehicle. The compact Nano-Fit 2.50mm pitch connectors are rated for up to 4.0A. With a 3.50mm pitch, the Ultra-Fit power connectors support 12.0A power. By achieving a 20% smaller footprint compared to similar power connectors, Ultra-Fit connectors offer significant PCB space savings with class-leading current density. Both the Nano-Fit and Ultra-Fit power connectors offer the premium housing features of the proven Micro-Fit, Mini-Fit and Mega-Fit connector systems, such as positive locking polarised housings with fully isolated headers. Colour-coded and mechanical-keyed housings mitigate the risk of mis-mating and an optional TPA (Terminal Position Assurance) retainer significantly reduces terminal backout. In addition, the ultra-low mating force eases assembly and helps minimise operator fatigue when mating numerous high-circuit connectors. The positive lock housing ensures that mated connector assemblies will not accidentally disengage, while the fully isolated header protects the terminals from potential damage during handling and mating.